Rosa Parks' stand against racial segregation spawned a protest that sparked the Civil Rights Movement. Saturday, February 22nd, represents a milestone in Parks' action and the subsequent Montgomery Bus Boycott. On that day, arrest warrants were issued for the boycott's leaders, including Dr. Martin Luther King, Jr. and Rev. Ralph Abernathy. Learning about the ensuing court cases, the city's rigid racial division, and the success of the boycott's nonviolent campaign represent a critical window into the Civil Rights struggle. Enslow Publishers' new title -- Rosa Parks and the Montgomery Bus Boycott in Photographs -- leverages text and pictures to deliver an historical narrative accessible and interesting for young readers. Author David Aretha's 48-page work combines age-appropriate text with strong photographs that bring this key moment in the American story to light. School librarians and teachers will especially find this Lexile 880 book useful for developing visual literacy as well as other key academic skills. 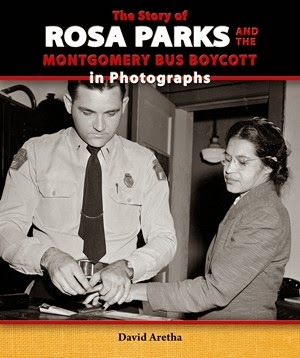 Rosa Parks and the Montgomery Bus Boycott in Photographs, included in Enslow's "The Story of the Civil Rights Movement in Photographs," is available directly from Enslow Publishers in a variety of formats, including library-bound book, paperback, and e-book. The series is also available from your preferred vendor, Barnes & Noble, and Amazon. great introduction to this man. Written by Patricia and Fredrick McKissack, this is an easy-to-read book, describing how Dr. King brought people of all races together to fight for equality without using violence. Readers will learn about the civil rights movement and what made Dr. King so special. Available in both library and paperback editions, as well as a multi-user eBook version, this title is available from your preferred vendor, enslow.com, your independent bookstore, Amazon, and Barnes and Noble. It was only a half-century ago that the notion of civil rights extending equally to all American citizens was far from universally accepted in our country. Some laws, especially at the state level, effectively diminished rights and opportunities for minorities and women. In early July, 1964, Congress and President Lyndon B. Johnson began to change that dynamic with the passage of the Civil Rights Act of 1964. This legislation, a precursor to the Voting Rights Act, added federal clout to accelerate these social changes. Among those who witnessed the law's presidential signing was Dr. Martin Luther King, Jr. His role in this movement is discussed in Patricia and Fredrick McKissack's Martin Luther King, Jr.: Civil Rights Leader. This well-written, 24-page book, included in Enslow Publishers' "Famous African Americans" series, is available in library-bound format directly from Enslow for $15.95. That price represents a 25% school/library discount from Enslow's list price. A paperback version is sold for $6.95. A multi-user e-book version is also available. You can also order these and other Enslow Publishers' titles from your preferred vendor, Barnes and Noble, and Amazon. New York Journal of Books reviews "When the Children Marched"
This May marked the 50th anniversary of the children's marches in Birmingham. We are thrilled that New York Journal of Books has just posted a great review of our book "When the Children Marched: The Birmingham Civil Rights Movement" by Robert H. Mayer. Reviewer Rita Lorraine Hubbard says, "This book should flourish wherever it is found..." You can read the full review here. The book and eBook are available wherever books and eBooks are sold including Amazon, Barnes and Noble, your favorite independent bookstore, or your preferred vendor. This year marks the 50th anniversary of when more than a thousand African-American students skipped their classes to march to downtown Birmingham, Alabama to speak out against segregation. On a hot Thursday morning in May young people went to school as usual, but at noon many left their classes and headed for the door. R.C. Johnson, the principal of Parker High School, locked the front gates. This did not stop the students. They scaled fences and headed to town. Eight hundred students throughout the city missed school that day. The Sixteenth Street Baptist Church filled with young people ranging from the ages of six to eighteen. At around one o'clock the first group of kids burst out of the church.They sang songs and carried signs as they headed for city hall to demonstrate. When the Children Marched: The Birmingham Civil Rights Movement by Robert H. Mayer explores the civil rights leaders who organized the movement and the brave children and teens at the heart of the fight. The Kindle version is now available as well as the hardcover book.